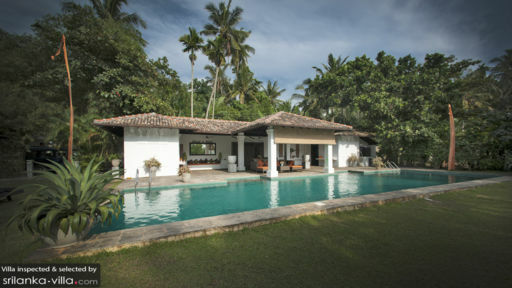 Tucked away from the city centers of Sri Lanka, Villa Mandalay Koggala is a hidden island gem! Completely silenced out from the noise of traffic, guests are spoiled with sounds of bustling leaves against the easy breeze. The 3-bedroom home is dispersed across two central pavilions and lot of land! A private pool, a wooden jetty, and multiple terrace lounges can be found. Nestled within the central pavilion, all 3-ensuite bedrooms are found. It is complete with sleek-glossy flooring, a carefully thawed ceiling, and intricately-chiseled wooden panelled doors. The carvings allow natural daylight to seep through the suites, complementing the darkly-stained beams. The upper ground suites open to its own terrace balcony to view the stunning panorama. Wrapped in pure white drapes, air-conditioning and ceiling fan facilities to cool the hottest tropical day. Nonetheless short of primitively extravagant, immaculate rugs, in-room seating arrangements are inclusive. The spacious, dimly-lit en-suite bathrooms feature sunken stone bath, twin vanities, and rain-shower facilities. The central area of the outdoors nestles amidst the lush gardens of the setting, a 10-meter long private pool. As its aquamarine waters glisten, rustic stone pavements match its unitarily primitive appeal. Alongside it are 6 sunloungers, poolside umbrellas, daybeds and a sprawling L-shaped sofa. 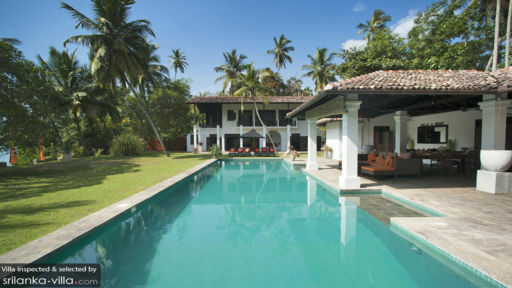 The cushions adorning the space are coloured bright orange and truly bring out the sunshines of sunny Sri Lanka. On the upper grounds, an L-shaped seating arrangement and a rocking chair is nestled above the chalky-white stone built terrace. A larger living area is placed beside the cascading staircase - the earthy-toned space is decked out in 2 long couches, generous amounts of cushions, a low-lying coffee table, a collection of bronze statement pieces as well as a rocking chair! All of which are located under a ceiling fan and the space’s air conditioning. Poolside and tucked away under the colonial-hallway, is the villa’s formal dining room. The central living room is an open-planned space that boasts thatched roofs and wooden beams. A second living area is decked out in a plush mattress underneath the pearly-white moroccan-style hallway. The space is completed with ceiling fans, a TV-set and multiple stone sculptures. A large team of staff is ready to spoil guests of Villa Mandalay Koggala with five-star help. A villa manager and assistant manager, a private chef, villa attendants, gardeners, a pool attendant, and 24 hour security guards, guests will not need to worry about keeping the mansion at tip-top shape! A small extra charge is added if masseuse and babysitters are requested. 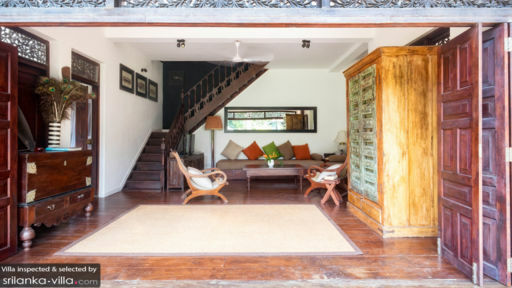 Neighbouring the Koggala Railway Station, Villa Mandalay Koggala is short drive away from the sweet-treats of AVM Cream House. Spend an afternoon at the Martin Wickramasinghe Museum and examine the traditional Sri Lankan clothing, weapons, and transports. A trip to Weligama Bay will grant guests with golden sand, colourful fishing boats, and a spot to snorkel, dive or surf! Perhaps go visit Zephyr Restaurant, where you can grab a cocktail or two! Allocate a day to pamper yourself at the famous Amangalla to enjoy refreshing detox scrubs or rejuvenating foot massages.